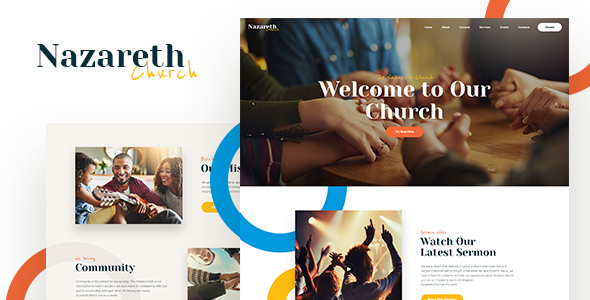 Nazareth is a beautiful, authentic & responsive non-profit Church WordPress Theme. It is created for modern church, prayer group, Christian, charity, volunteering, believer community. Also it fits God leadership academy and non-profit organization, agency services, business firm & company. Furthermore, it will be great for: Baptist church, Protestant Church, Christian Church, volunteer & funding website, pastor or preacher that wants to help people via Jesus. Nazareth has popular Events Calendar – create and show upcoming events: summer camp, Sunday School, Live Streaming, Bible, Gospel, Sermon, Worship, Ministries, Prayer, book reading, etc, as well as religion news and blog. It is compatible with Elementor Page Builder. We’ve made our theme compatible with Give Donations plugin which is a powerful feature for fundraising and charity!